Each year in Wisconsin, alfalfa stands are at risk of being injured or killed by winter conditions such as cold temperatures, ice sheets and heaving. Having the ability to evaluate this injury early in spring is helpful in making crop rotation decisions. This article will discuss factors affecting winter injury and “how to” methods to evaluate it. How do plants prepare for winter? Cell membranes change to allow them to remain more fluid and so more functional at colder temperatures. Sugars accumulate within the cells to lower cell freezing point. While this is sometimes cites as the primary mechanism for freezing tolerance, in fact this only lowers the freezing point 1 or 2 degrees. Compounds accumulate within the cell which absorb free water. Water in this state does not freeze and so cannot damage the cell. Cells lose water. This is the most important way plant cells tolerate freezing temperatures. Water located in the cell walls, outside the cell, freezes. This does not damage cells but serves to “pull” even more water out of the cell. This water also freezes and the process continues until the cell is extremely dehydrated. This dehydration, coupled with absorption of free water in the cell (previous point), means there is very little water left to freeze and damage the cell. The processes described above allow alfalfa to tolerate temperatures as low as 5 to15°F, depending on variety and past management. Below this temperature, water left within the cell freezes forming ice crystals that puncture the cell membrane. When cells thaw, they die as water and cell contents leak from the cells. Research has shown increased electrolyte leakage and cell rupture of alfalfa taproot cells exposed to 17.6°F for as little as 30 minutes. Another way cells are killed is from the extreme dehydration they experience as more and more water is pulled from the cells. There are some varietal differences in dehydration tolerance. Winter injury or death can occur from ice sheets that prevent air exchange to the alfalfa crowns. Toxic metabolites such as ethanol, methanol and lactic acid then accumulate which kill the alfalfa plant. Alfalfa can tolerate up to about 3 weeks of this before they are killed (less if soil temperatures are near freezing and longer if the soil is colder). What factors affect winter injury? Stand age. Older stands are more likely to winterkill than younger ones. Variety. Varieties with superior winter-hardiness ratings and a high disease resistance index are less likely to experience winter injury. Soil pH. Stands growing on soil with a pH about 6.6 are less likely to experience winter injury. Soil Fertility. Stands with high fertility, particularly potassium, are less likely to experience winter injury than those with low fertility. Soil moisture. 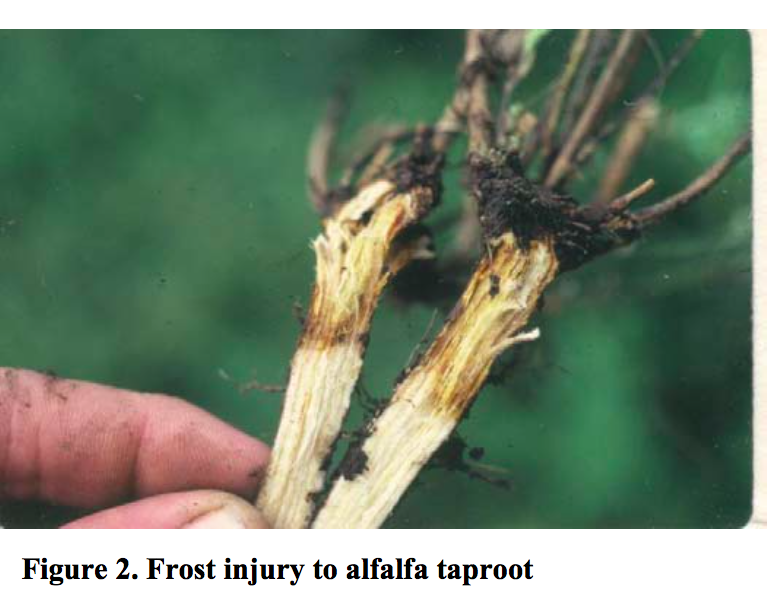 Alfalfa grown on well-drained soils is less pone to winter injury. Fall soil moisture status. As dehydration is the primary means of tolerating freezing temperatures, stands that go into winter with low soil moisture are better able to lose moisture and are less likely to winter kill. Cutting Management. Both harvest frequency and timing of fall cutting affect alfalfa winter hardiness. The shorter the interval between cuttings, the greater is the risk of winter injury. Stands in which a last cutting is taken between September 1st and October 15th are at greater risk, as plants are unable to replenish root carbohydrate reserves before winter. Snow cover. Snow is an excellent insulator. The figure below shows soils temperatures under 0, 10 cm (4 inches), or 20 cm (8 inches) of snow. Temperature fluctuations are much less under snow cover. 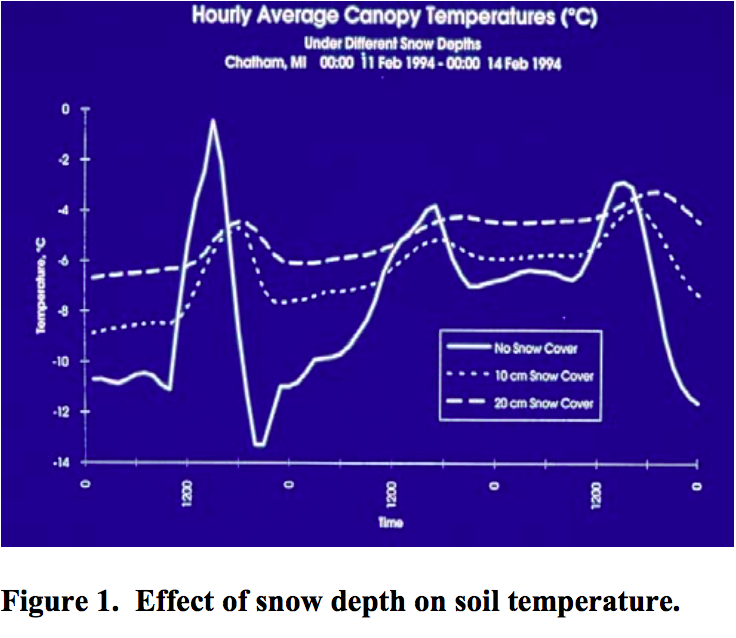 As little as 4 inches of snow can result in a 10°F difference in soil temperatures. Stands which have not been cut after September 1st or which have at least 6 inches of stubble left will be able to retain more snow cover and be less susceptible to winter injury. 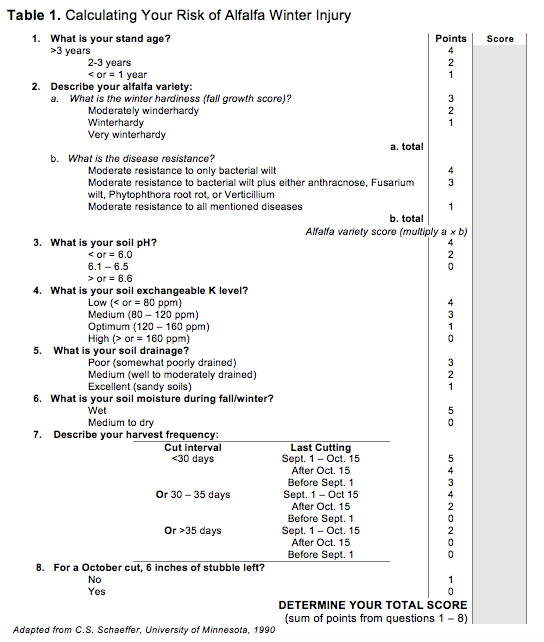 See Table 1 (below) to evaluate an alfalfa stand’s risk of winter injury. How do I diagnose winter injury? Slow Green Up. One of the most evident results of winter injury is that stands are slow to green up. If other fields in the area are starting to grow and yours are still brown, it is time to check those stands for injury or death. Asymmetrical Growth. Buds for spring growth are formed during the previous fall. If parts of an alfalfa root are killed and others are not, only the living portion of the crown will give rise to new shoots resulting in a crown with shoots on only one side, or asymmetrical growth. Uneven Growth. During winter, some buds on a plant crown may be killed and others may not. The uninjured buds will start growth early while the killed buds must be replaced by new buds formed in spring. This will result in shoots of different height on the same plant, with the shoots from buds formed in spring several inches shorter than the shoots arising from fall buds. Root Damage. The best way to diagnose winter injury is by digging up plants (4 to 6 inches deep) and examining roots. Healthy roots should be firm and white in color with little evidence of root rot. Winter killed roots will have a gray, water-soaked appearance early, just after soils thaw. Once water leaves the root, the tissue will become brown, dehydrated and stringy (see Figure 2). If the root is soft and water can be easily squeezed from it, or is brown, dry and stringy, it is most likely winter killed. Also, if 50% or more of the root is blackened from root rot, the plant will most likely die during spring green up or later in the year. See UW Extension Publication A3620 for more details on evaluating root health. My Alfalfa stand is winter injured. Now what? For example, an alfalfa stand with 50 stems/ft2 would have a yield potential of 5.38. Remember, this is potential yield. Soil factors, nutrient deficiency, insects, diseases and many other things may affect the actual yield. Allow alfalfa plants to mature longer before cutting. Allowing plants to mature to early, mid or even full bloom will help the plants restore needed carbohydrates for subsequent production. How long and during which cutting depends on the extent of winter injury. For severely injured stands, allow plants to go to nearly full bloom in first cut and to early flower in subsequent cuttings. This will give these stands the best chance at survival. 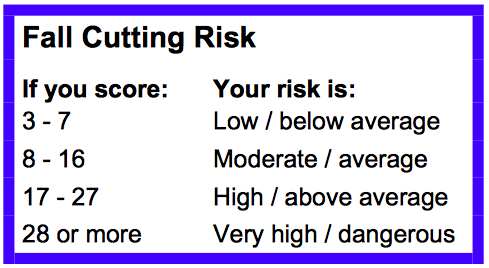 Stands with less injury could be harvested somewhat earlier depending on the extent of the injury. Stands with only mild injury could be allowed to go to 10 to 25% bloom at sometime during the season. It may be best to choose second or third cutting with these stands as first crop is usually the highest yielding. Increase cutting height. This is particularly important when allowing plants to flower before cutting. As this time, new shoots may be developing at the bas of the plants. It is important to not remove these shoots as it will further weaken the plant to have to produce new one. Fertilize. It is particularly important that winter injured stands have adequate fertility. Soil test and apply needed fertilizer prior to first cutting if possible. Control Weeds. Herbicide applications to control weed competition will help the stand by eliminating weeds that compete for moisture, light and nutrients. after Sept 1st to allow for the buildup of food reserves prior to winter unless the intent is to plow down the stand.